Mundane as it may seem, your morning bowl of cornflakes is “the product of high drama,” said Michael Upchurch in the Chicago Tribune. 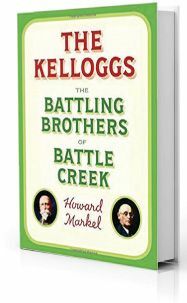 The Kellogg cereal empire, which changed how Americans eat, was created by two Michigan brothers so combative, when author Howard Markel calls them the Cain and Abel of the American Heartland, he’s “not exaggerating by much.” The long feud between John Harvey Kellogg and Will Keith Kellogg is the core of Markel’s lively, if not always deftly written, new book. But as the opening pages promise, the brothers’ story affords “a superb window” through which to view nearly a century that transformed the mores, lifestyles, and belief systems of Americans from coast to coast. John and Will, ironically, seem to have needed one another—and their church—to succeed at the level they did, said Matthew Price in The Boston Globe. John, born in 1852, used the Seventh Day Adventists’ financial support to earn a medical degree before returning to Battle Creek, Mich., to establish the church’s Battle Creek Sanitarium—a retreat soon famed as a wellspring of health advice and of the toasted cornflakes John touted as a digestive aid. But because John was a bad manager, “none of this would have been possible” without Will. For years, the younger Kellogg kept the institution humming while putting up with having to shine John’s shoes and even take toilet-side dictation. In 1906—around the time John began nursing an interest in eugenics—Will broke away and turned the sanatorium’s cereal recipes into the thriving business he and John fought over for the rest of their lives.